Parenting a teenager can be challenging and rewarding. Being an adolescent isn’t always smooth sailing either. 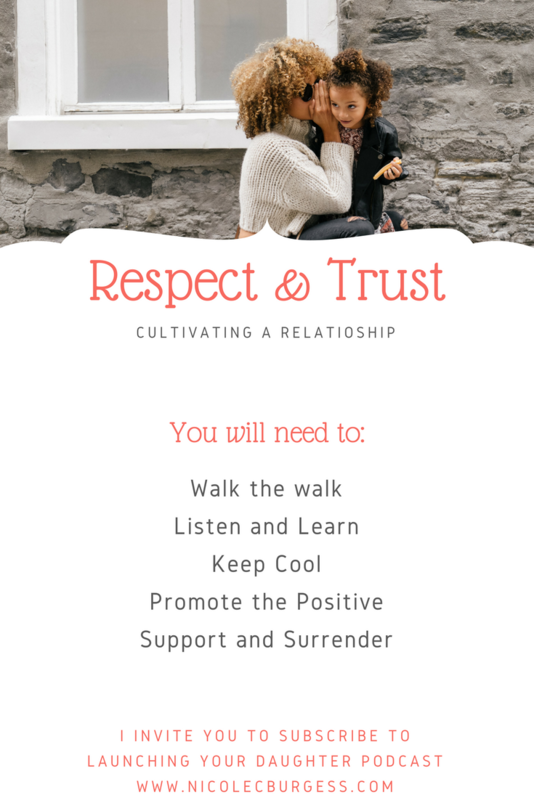 Below are five tips that can help cultivate a relationship of respect and trust between you and your daughter. Earn your daughter’s trust by showing that you are trustworthy. Say what you mean, mean what you say and do what you said you’d do. Your honesty, openness, consistency and integrity make you a strong role model for her. Listening without judgment creates a space where your daughter can feel free to talk about what’s going on in her life. That can help you gain insight into what’s important to her, and where she might need support. Keep in mind that if you’re thinking about what she’s saying while she’s talking, you’re not really listening. When she’s finished, repeat what she said in your own words to let her know you heard her and to clear up any possible miscommunication. Sooner later she’s bound to drop a bombshell—a tattoo, a pregnancy, a drug problem or something else. It’s OK to tell her that you need time to process what she’s told you before you respond. By staying calm in an emotionally tense situation, you show her that she can trust you. You also model for her how to channel intense emotions, which will help her in her own life. Instead of criticizing, focus on what’s she’s doing right and acknowledge her efforts. In other words, catch her being good. Giving her the credit she deserves provides positive reinforcement and praising her good qualities can help build her sense of self and self-worth. You’ll want to offer guidance when you think she’s going to get herself in trouble. Keep in mind you can’t protect her from everything, and sometimes experience really is the best teacher. We’ve all learned from painful lessons. There may be times that the things she gets herself into provide you with an opportunity to learn how to trust that your relationship is solid, you’ve guided her well and she has the skills she needs to make decisions that are in her own best interest. Nicole Burgess LMFT works with teen girls and women in overcoming anxiety and perfectionism and rediscovering joy. She offers both office and online therapy sessions for Indiana and California residents.